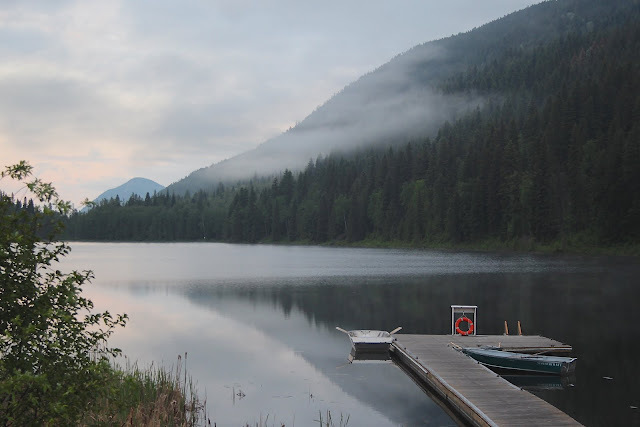 So with some reluctance we left behind the charms of Revelstoke, continuing along the Trans Canada Highway through deep forested valleys and beside deeper, darker lakes, the road always playing footsie with the railway. We made a few stops en route, enjoying ice creams under blistering mid day sun at the end of a lake jetty at Salmon Arm, coming by late afternoon to Little Shuswap Lake. This is First Nations land and the Little Shuswap Lake Indian Band or Secwepemc have built a succesful business here - hotel, golf course and well regarded restaurant, with all benefits being polughed back for the benefit of the whole nation. We walked along the shore of the lake and then enjoyed an excellent meal here, before travelling on next morning. A long drive, avoiding Kamloops, a large industrial town, and then we were up on quiet back roads, mostly just dirt, into Alpine country: high valleys, with forests coming down to hidden lakes, and the odd farm with a German name and a herd of dairy cattle. 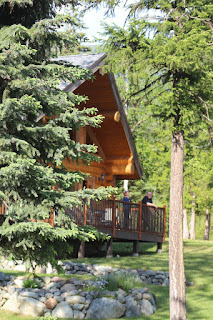 We stayed in a big three bedroomed lodge in a little resort called Alpine Meadows, just a cluster of swiss style log houses with steep roofs and stone fireplaces, by a perfectly still lake. Lots of wild life to be seen, with fish leaping to ripple the surface, families of ducks and geese, woodpeckers and many others. Later we found out a bear had tried to get into our lodge while we were away, and we saw several black bears in the vicinity. The nearest town, at the entrance to Wells Gray Provincial Park, had a surprisingly well stocked supermarket and the obligatory liquor store, so we were well supplied for a couple of days of home cooking, making the most of this little idyll. We rowed out on to the lake, rather gingerly, and enjoyed the sense of calm. The blue hole was still with us.